Hello, my name is Christopher Hawker. I am a professional inventor, specializing in innovative consumer products. My company is called Trident Design, LLC. I have developed many products in numerous industries and have over 20 products on the market. 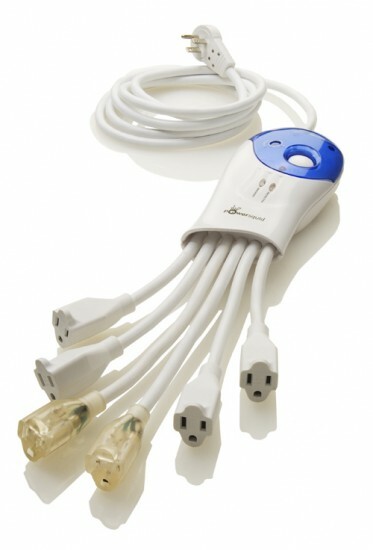 My most famous invention is the PowerSquid, a cephalopod-inspired power strip with outlets situated at the end of short cords, thereby eliminating the problem of losing outlets to bulky transformer plugs. John Biggs, editor-in-chief of this blog, has asked me to write the story of the birth of the PowerSquid and its development and journey to market. This is the Song of the PowerSquid. This is part 6 of a 6 part series. Read them all here. In the summer of 2006, I got a call from the president of Power Sentry to tell me that they were being bought by Philips, the Netherlands-based consumer electronics giant. My initial instinct was that this would be a mixed bag. They were just too large. He reassured that it would be great for the PowerSquid, with the awesome brand and marketing power of this giant, worldwide corporation suddenly behind our product. What really ended up happening was that the huge corporation barley noticed that it sold PowerSquid, since it had thousands and thousands of other products. The lack of focus quickly became evident as the relationship began to unfold. Most notably in their responsiveness to our needs as Flexity, which usually amounted to, “bad news delivered late.” Nevertheless, we continued to push Flexity. Philips agreed to let us distribute their other power products to our customers, so we became a distributor of the original non-surge PowerSquid, as well as their lower-end (UL Listed) surge protectors. We successfully sold the Calamari into Dell’s and Apple’s online stores, which were two of our major targets all along. Unfortunately, they both sequestered them to the last page of their surge protector sections. We had no “pay-to-play” money to get higher placement. With no special attention drawn to them and backwoods positioning, neither venue proved as successful as our own site. We went to the CES show in January 2007 with a bigger, fancier exhibit booth and hoped we would renew interest in our products. It was a huge expense for us, but one we felt would pay off. We were wrong. Our booth was in an awkward spot where traffic flowed all around us, but very little came to us. We were hidden in plain sight. We emerged with only one promising lead – a satellite dish installer company with a fleet of 6,000 vans that was willing to sell the PowerSquid out of their vans. They placed several large orders, but then they were purchased by a private equity firm which immediately ended the practice of selling stuff to customers. They wanted to refocus on their core business, installations. We suddenly lost our one big client and we were devastated. We spent the next year trying to get more major customers to no avail and adjusting expectations to the new reality that Flexity was going to be a much more modest company than we had imagined. On the other hand, Philips’ sales of PowerSquid were still going strong. The initial agreement we had negotiated with Power Sentry was ending, so I was in position to renegotiate terms of the license or go elsewhere. Working with a brilliant negotiation expert I had met, I approached other industry players and received significant interest, but, in the end, Philips made an offer we couldn’t refuse and we extended the agreement for the life of the patent. For no apparent reason, Philips waited six months to send me the signed renewal contract, leaving me in an agonizingly stressful limbo. When it finally did arrive, however, the new deal was lucrative. So that brings us to today. I moved back to Columbus in 2007 and restarted my design consultancy, funded by PowerSquid royalties. We have been busy developing a line of gourmet cooking gadgets in partnership with RSVP, a small company based in Seattle run by a dear friend of mine. Our Onion Goggles have been a hit (they were reviewed here on CrunchGear not that long ago). We launched six more gourmet products with RSVP this year. I have just recently started manufacturing and marketing another one of my inventions, the Thirsty Light, a device that goes in houseplant soil and blinks when the plant needs water. And there is more on the way: a star clock, a new innovative power strip, and a glowing rock. We still operate Flexity, which is now building slowly into a nice business. Anticlimactically, MET Lab finally passed the six-armed Squid in 2008, but the specs were changing in 2009 so the certification was only good for six months. Philips still sells a lot of PowerSquid and sends us a royalty check every month. The PowerSquid has been a long, amazing journey full of excitement, opportunity, disappointments, struggles, failures, and successes. It has been the best learning experience of my life and the greatest opportunity. It has opened doors and made me fairly well-known in the invention industry, giving me enough credibility to earn an audience with most manufacturers. I am thankful for the journey’s experience and rewards. Stay tuned for the next exciting innovation from… the amazing SQUIDBOY!! Christopher Hawker, an inventor specializing in innovative consumer products, is founder of Trident Design, LLC in Columbus, Ohio. He is the author of “Inventor’s Mind: 10 Steps to Making Money From your Inventions”, a free e-book available at Invent-Shop.com. He will be hosting his first InventShop Inventor’s Workshop in October 2009 for serious inventors who want to learn his inventing system. Want a PowerSquid? Leave a comment below (including your email) and we’ll pick one commenter at random per day.